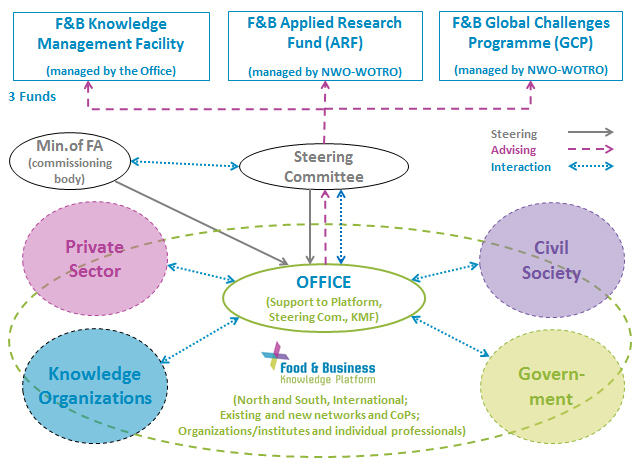 The box below shows the organizational structure and management of the Food & Business Knowledge Platform. The Platform comprises existing and new networks and communities of practice, organizations, institutions and individual professionals from the North and the South, and is not limited to the 15 focus countries of the Dutch Ministry of Foreign Affairs. The Ministry of Foreign Affairs (Directorate General for International Cooperation) is the commissioning body. The Steering Committee decides on the knowledge agenda. After knowledge questions have been articulated in the Platform, the Steering Committee determines which issues are relevant to and have priority for the call of the GCP-fund. The Steering Committee, supported by the Office and WOTRO, helps monitor the effectiveness of the ARF and, if necessary, consults with NWO-WOTRO on improving the ARF calls. The Office facilitates the knowledge management of the Platform, undertakes its own activities and renders account to the Steering Committee for the substantive functioning of the platform (its activities and, more especially, its results). It is accountable to the Ministry for matters relating to financial administration. The Office also manages the Knowledge Management Facility (KMF), a budget for organising studies, expert meetings, debates, etc. on request of Platform, Steering Committee, Ministry of Foreign Affairs and the Dutch embassies in Low and Middle Income countries (LMIC). NWO-WOTRO manages the GCP and ARF. Proposals for the GCP need to be submitted by Dutch knowledge institutes. For the ARF, practitioner organizations in the 15 focus countries of the Ministry and their knowledge partners are eligible to submit proposals. For the two funds (ARF and GCP), the Office facilitates the CoPs and supports researchers in sharing knowledge and the results of their research. Read more about these funds.